Texas Hold’Em is probably the most popular of all variations of the classic card game. Texas Hold’Em has captivated the attention of millions and people have walked away from the gambling table with a lot of money thanks to hitting really hot win streaks. While the game is not an “easy” one to play, the basic rules of poker are in effect. As long as you have a basic grasp of poker, there is no reason why you shouldn’t do well at the Texas Hold’Em version. And now you never have to miss a session playing. Dragonplay Poker Texas Hold’Em is available in an app form and ready for quick and immediate download. Dragonplay has a real winner on its hands with this game. 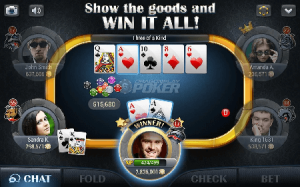 It has been the number one poker game on Android for several years now. The popularity is surely only going to continue to grow. The awesome graphics really allow the virtual card table to come alive. Even though you may be playing your hand from a mobile device, the entire experience presents a “you are there” feel. How popular is this game? About 25 million Android users play regularly. That is an astounding number! You can join the fun for free and play against a number of your fellow poker fans. Signing up is extremely simple. You could log in through your Facebook account if you so desired. The minute you open up your account for the first time you receive $500,000 in free chips. That is a lot of hands you can play. Make the most of the gift. No, real money play is not an option. Still, playing for fun is going to bring forth a number of rewards. Those who have a fondness for tournaments won’t be disappointed with game play here. Shootout poker and Sit-n-Go poker tournament options are available. Poker Ring games are also accessible. No one is ever, ever going to feel bored playing Texas Hold’Em when using the Dragonplay app. It really does deliver a fun experience. A live chat feature further extends the way the phases of how to get the most out of the game. There are a lot of ways the game can be described. Dull is most assuredly not going to be one of them. Download the app today, sign in, and get started. Texas Hold’Em has never been more fun to try out.